This will only be short, out of respect for Rachel Geiger’s excellent review already available here. However, I’ve seen this film a few times now and feel that I have to say something about it. Birdman stars Michael Keaton as Riggan, a troubled actor most famous for playing comic book superhero Birdman (who from what I gather is a parody of Batman, a character played by Keaton and with a similarly deep voice). Riggan is set to write, direct and star in a Broadway play, which he hopes will reignite his career away from the bird suit and make everyone, including his family, love him again. First of all, the story on its own is very good – as you would expect when there’s 4 different writers working on it! The characters are interesting and engaging, but most importantly funny! I’ve never seen a film that combines legitimate drama with comedy in a way that leans it more towards being a funny film, that still goes down so well with the masses! The acting in general is also very good. Keaton does a great job leading the film with a very complex character, and is supported behind him with very funny performances by Norton, Galifianakis, Watts and Riseborough. I think that’s the idea in Birdman – Keaton’s character delivers the drama alongside Emma Stone, who plays Riggan’s estranged daughter, while the rest are tasked with keeping the film relatively light-hearted and funny. The directing by Iñárritu is incredible, and is the main thing that sets this apart from the rest. The way the film never cuts, flowing naturally from scene to scene is the stand out feature, and creates a unique visual feel that could rival any film out there, past and present. 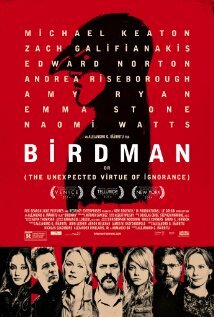 Credit must go out to whoever created the drum based score – it’s very subtle yet powerful sounds in the background carry you through the movie and help portray the natural feel Birdman tries to give off throughout – what with its lack of cuts and ‘behind the scenes’ story. Birdman is a worthy winner of awards, and while it isn’t the most funny film ever, and isn’t the most dramatic, it is by far the best ever mixture of the two. Also, the directing and score in Birdman is some of the best work I’ve ever seen. All in all, this is the ultimate in creativity and invention. A lot of attention will be on Alejandro G. Iñárritu after what he did here. He is currently filming the movie adaptation of The Revenant, which is set for release around Christmas and New Year and features the talents of Tom Hardy, Leonardo DiCaprio, Domhnall Gleeson and Will Poulter. One can only hope he can take the magic of Birdman and translate it to this, but going from drama-comedy to a period piece (this is set in the 1820’s) will be a big challenge.